Even though Overwatch’s mascot character is an out lesbian, the game didn’t offer any Pride-themed events or costumes this month. So players have found their own ways to celebrate. When Blizzard released a holiday comic that showed the Overwatch mascot character, Tracer, celebrating Christmas with her girlfriend, fans were ecstatic. They’d already been writing fic and drawing pictures of their favorite Overwatch heroes in gay as hell couplings, but seeing the game developers confirm at least one character’s queerness felt all the more gratifying. The content from Overwatch comics and video shorts barely appears in the game itself, but fans cling to it. Update - 4:02: a previous version of this article declined to mention a recently added spray featuring Tracer’s girlfriend. The Overwatch fans who want to celebrate Pride have found ways to bring that discussion into the game with Tracer and other characters as well. In the past two decades, rights for LGBT people have made considerable strides, thanks in part to visible activism like Pride parades. Even if things are better for LGBT people in some parts of the world, that doesn’t mean Pride has stopped being important, even in the games we play. Pride didn’t begin as a parade or a month-long advertising campaign for corporations to signal that they’re down with the gays. It began as a commemoration of the Stonewall Riots, during which a police raid of the gay nightclub, the Stonewall Inn, turned to violence. Bisexual activist Brenda Howard organized the Christopher Street Liberation March on the anniversary of the riot, and since then, June has been a month for LGBT people around the world to declare that they’re here, they won’t be ashamed of who they are, and they won’t live in fear from the police or anyone else. Because Overwatch has a major gay character and a strong LGBT community, there are players who are trying to find ways to celebrate pride while also avoiding getting hit by cars on Oasis. When I asked fans on Twitter how they’re celebrating Pride in Overwatch, some of them said they were choosing skins they felt were inspired by LGBT culture, like Moira’s Bowie inspired skin or Zarya’s 80's skin, which features the buff, butch lady in a crop top reading “Let’s Get Physical.” Unsurprisingly, Tracer was most player’s character of choice to celebrate Pride. Not everyone who plays Overwatch plays Tracer, though, so they have to come up with other ways to celebrate. For some, that means buying and wearing skins for the Overwatch League team the LA Valiant, the only team selling merch for Pride. Others choose skins for the Houston Outlaws, which has openly gay player Austin “Muma” Wilmot on the roster. “I rock the Outlaws skin on Winston and Reinhardt,” a player named Simon said. Another player, Miryam, said they choose the Outlaws’ skins specifically to support Muma. For others, showing your Pride is just about the colors of the skin. All of these efforts to celebrate Pride have a certain kind of internal logic, although they aren’t “official” (other than LA Valiant’s Pride patch). Lucio’s Roxo skin does indeed have the same purple, pink and blue shades as the bisexual flag, Tracer’s Origins skin is pretty butch with her Top Gun style aviators, and wearing the skin of the only team with an openly gay player is a relatively clear signal that you’re at least an ally. But these are half measures, which takes away from the “loud and proud” spirit of Pride. If people outside the community aren’t picking up on what you’re putting down, then does it count as celebrating Pride to begin with? 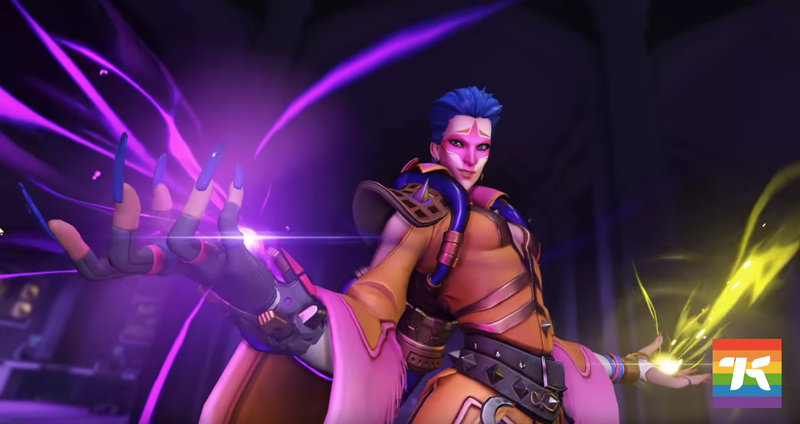 Given that Blizzard released a skin for Mercy with proceeds going to breast cancer research, a skin for Pride month doesn’t seem unreasonable. Some players wish they had more options. For a game with a lesbian on the cover of the box, there don’t appear to be very many ways to express being LGBT in Overwatch. It might sound silly to want to show this off in a game where sometimes your most pressing concern is whether or not your team is actually on the payload, but clearly, it matters to some players—enough that they’ve found ways to make it happen, even without official skins or events. Perhaps next year they’ll find even more visible ways to celebrate.